Chris Sale was born on Thursday, March 30, 1989, in Lakeland, Florida. 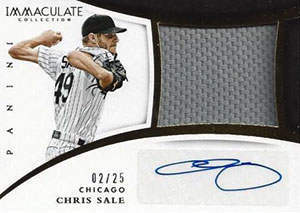 Sale was 21 years old when he broke into the big leagues on August 6, 2010, with the Chicago White Sox. His biographical data, year-by-year hitting stats, fielding stats, pitching stats (where applicable), career totals, uniform numbers, salary data and miscellaneous items-of-interest are presented by Baseball Almanac on this comprehensive Chris Sale baseball stats page. Did you know that Chris Sale set the Chicago White Sox single-season record for strikeouts in 2015 , with 274? Rounding out the top five Pale Hose who came before Sale, we only need to look at one pitcher, Hall of Famer Ed Walsh , who had the record with 269 strikeouts in 1908 , second place with 258 in 1910 , third place with 255 in 1911 , and fourth place with 254 in 1912 ! When Ed Walsh set the original team record for strikeouts in a season (269 strikeouts in 1908 ), he did so across 464 innings pitched, making the mark set by Sale in 2015 even more remarkable as he set the new record in only 208.2 innings - 11.92 strikeouts per 9.0 innings pitched, a new White Sox record as well! Chris Sale Sets Strikeout Record | October 2, 2015 | MLB Advanced Media, L.P.
Chris Sale was named to four consecutive All-Star Games ( 2012 , 2013 , 2014 , 2015 ), only the second Chicago White Sox pitcher sent to back-to-back-to-back-to-back Midsummer Classics . The first was also a lefty, he was sent to five straight ( 1955 , 1956 , 1957 , 1958 , 1959 ), and his nickname was Billy the Kid - click his nickname if you don't know who it was. What do Chris Sale (2017), Nolan Ryan (1977), Randy Johnson (1999, 2000, 2001) and Pedro Martinez (2000) have in common, besides being amazing pitchers? They are the only four pitchers in Major League history to mow down 200 batters, during the same season, during their first twenty-starts!